A grantor may own a revocable or irrevocable trust. The difference between the two types of trusts determines whether the grantor should transfer personal and household property into it. 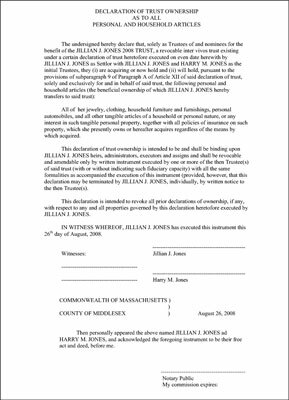 If the grantor has established a revocable trust, he or she can transfer some or all of his or her personal and household items into the trust by means of a one-page declaration, notarized and witnessed. This figure shows a sample that’s been successful in avoiding probate. Declaration of Trust Ownership as to all personal and household articles. Click here to view this declaration. If the grantor has funded an irrevocable trust, he or she definitely doesn’t want to include household and personal property (except for, items that have the possibility of increasing in value greatly during the grantor’s lifetime). Remember, transfers into an irrevocable trust mean the grantor is giving up all right, title, and interest in the property. If that property remains in the grantor’s house, and the grantor continues to use it, the IRS would be well within its rights to question the validity of the transfer and disallow the gift.